Much to the delight of Pens' fans everywhere, the first month of the Philadelphia Flyers' campaign served as nothing more than a metaphorical pit of quicksand. From the early firing of Peter Laviolette to Claude Giroux's goal scoring ineptitude, it's hard to imagine more of an early season train wreck in The City of Brothery Love. And, while the Flyers are currently riding a three game winning streak, Philly still faces an uphill climb given the club's horrendous start. But, you know what? None of that mattered in last night's tilt between the Penguins and Flyers. It didn't matter that, coming into the contest, Pittsburgh was pacing the Metropolitan Division while Philadelphia dwelled in the basement. It didn't matter that Sidney Crosby was tied for the league lead in scoring while Giroux had potted only a single marker in 17 games. No, in reality, anything can happen whenever these two clubs get together. Because, when arguably the greatest rivalry in hockey takes center stage, all bets are off. What did matter (at least from a Pittsburgh perspective) was a blatant opportunity staring Crosby and Evgeni Malkin in the face. Specifically, the contest reeked of the potential for both superstars to put scoring slumps behind them. After all, Sid and Geno have torched few clubs more than Philadelphia. And, with the Flyers currently representing the epitome of defensive mediocrity, last night presented the perfect opportunity to get back on track. Sid started the season on absolute fire, catapulting himself to the forefront of the race for the Art Ross Trophy. Entering last night, though, Crosby hadn't lit the lamp in seven contests, producing "only" five points in that span. Consequently, his lead in the scoring race has since evaporated. With a date against the Flyers, however, Sidney found himself primed to end that slump. Considering he had produced 29 goals and 73 points in just 44 games against the Pens' cross state rivals, there aren't many squads Crosby has found more success against. In fact, Sid has only haunted the Islanders more in terms of point production over the years. Clearly, if there was ever a team to end a slump against, it might just be the hated Flyers. True to form, the Pens' captain found the back of the net against Philadelphia. After creating an opportunity that ultimately resulted in a disallowed goal on the game's first shift, Sid tied the contest in the second frame off a perfect set up courtesy of Malkin. 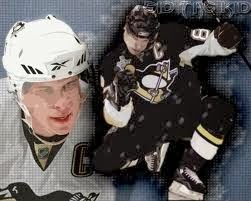 Still, despite creating numerous opportunities, Sid's typical killer instinct betrayed him more than once last night. After failing to convert on a partial breakaway and glorious opportunity around the net late in the second period, Crosby missed out on an opportunity to jab another dagger in his most hated rival. Unlike Crosby, Geno hasn't had much success at all this year. Only potting three tallies in the club's first 17 games, Malkin has appeared frustrated for much of the season. With the return of James Neal and some recent dominating performances, though, those in Western Pennsylvania are hoping the drought comes to an end soon. Much like Crosby, however, Evgeni has dominated the Flyers throughout his career. After putting up 22 goals and 57 points in 40 games, it would seem a meeting with the Flyers could prove to be just what the doctor ordered for Geno. Unfortunately, it wasn't to be, at least not last night. The goal drought continues but, make no mistake, Malkin was a magician with the puck against the Flyers. Arguably the best player on the ice, Geno set up countless opportunities throughout the evening only to see either Ray Emery swallow up shots or pucks fired wide. In the end, it was another frustrating evening for the Penguins' faithful. But, thankfully, an NHL season is a marathon, not a sprint. Pittsburgh might be struggling to put the puck in the net now but the big guns are still creating chances. And, as a result, things will likely soon turn around; the law of averages will eventually kick in. Just take comfort in knowing the drought is occuring early in the season instead of May or June.